Selecting the types of windows to use in your house is a big decision if you are building a house. If you buy existing house plans or buy a house from a developer those window selections have already been made, but often you can pay to upgrade to a different window. What windows types are available and what are the advantages of the different choices? The different types of windows come down to differences in mechanics, differences in materials, and differences in looks. Today’s article will cover the mechanical differences. Let us take a look at the mechanical differences first. Within the realm of mechanics you have differences in the opening style, and you have differences in the number of layers of glass. You can have a single layer of glass, or you can have two or three layers of glass. If you have either of the latter you have insulated windows. We use the terms single pane window, double pane window, and triple pane window to identify how many layers are used. In a double pane window is a little space between the glass and the cavity has been filled with an inert gas, usually argon. This keeps moisture from forming on the inside. If moisture forms on the inside it is because the seal has been broken. This has happened to me and is one reason why a good manufacturer and a good warranty is important with windows. Replacing just the glass is possible but usually requires you to send the window back to the manufacturer. If a seal is broken and moisture gets inside, it is best to fix it quickly. Fogged up windows can eventually result in an etching of the glass. One variation on the double pane window is to have a blind between the layers of glass. This is a neat feature, which I generally like, but it does have some problems. If you decide you want blinds of a different color you have to change out the window. If the blind mechanism gets broken you also have to change out the window. I would only use these types of windows where there was a big advantage to having the blind built in. For the bulk of the windows stay with the traditional window design. The space between the panes will vary from brand to brand. There is some value to having a wider gap. It reduces heat loss and the likelihood of condensation forming on the glass. A triple pane window is a rarity. They are available, but there is a diminishing return. You save a lot of energy going from a single pane window to a double pane window. You save a little bit more going to a triple pane window, but maybe not enough to recover your extra costs. I once spent some time in Bosnia helping with reconstruction. They often had double pane windows where each pane was in a separate frame. To open the window you would open the inner frame first and then the outer frame. Since you couldn’t fill the space between the panes with an inert gas moisture would form on the glass. I never see this type of construction in the United States, but I suspect that some older homes have it. Moving on to the mechanics of the opening there are types of windows that don’t open at all, windows that pivot open but without any mechanical control, casement windows, and double hung windows. Not every window in a house has to open. It is nice, on a breezy spring day, to open up all the windows, but even during exceptional weather it is rare that I open all my windows. You have to be careful how you mix in these static windows. If they don’t match your other windows you need to consider how they will affect the overall look of the house. Plate glass windows don’t open, which is fine for the view, but doesn’t provide ventilation. Sometimes people will have a plate glass window but right below or above you they have a separate window for ventilation. The up-side for plate glass is that you save some money. Windows can be expensive, so this is a big deal. In my basement I installed some inexpensive windows that pivot down from the bottom edge. This is what is known as a hopper window. There is nothing fancy about them. They simply flop open until the bump into the wall. Slightly fancier hopper windows have some mechanism that limits how much they open. My hopper windows provide a great view and excellent ventilation, but it is all or nothing. I can’t open them just a crack. For that room they are perfect. I wouldn’t want them in my living room. For that I have double hung windows, which is probably what you have. They have become the go-to standard, and have been for many decades. In my 1906 Foursquare the windows were originally counter-balanced with weights that were hidden behind the window moldings. That was the way modern windows were built back in the day. Unfortunately the weights required an open channel and that is an area that couldn’t be insulated, so the old windows were sources of heat loss, even if you replaced the single-pane glass with double-pane. They are called double hung windows because they are hung from above and because there are two tracks, allowing for an upper window, and a lower window. I also have a single hung window in my bathroom. In the case of a single hung window there is only one track. In most single hung windows their are two windows but one of these is fixed in place. In my single hung window the window slides up the track into a pocket in the wall above the window. The advantage of a single hung window is cost. In all other respects a double hung window is better. When I moved into my house it only took one winter to convince me to replace the windows. Modern windows use internal springs and friction to hold the windows in place, so the old weight channels could be filled in. My windows are vinyl with a wood veneer, and like most such windows can tilt in for easy cleaning. The modern double hung window isn't hung from above. They should probable come up with a new name for these types of windows. The brackets for the frames connect into continuous loop pulleys on the side, but often the brackets are on the bottom. 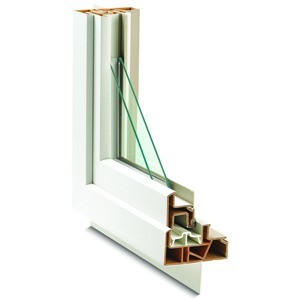 A spring mechanism provides resistance so that windows the will stay where you put them. A casement window is another option. A casement window uses a mechanical linkage to control the opening of the window.The window swings out, either horizontally or vertically. Usually the linkage prevents the window from opening completely. 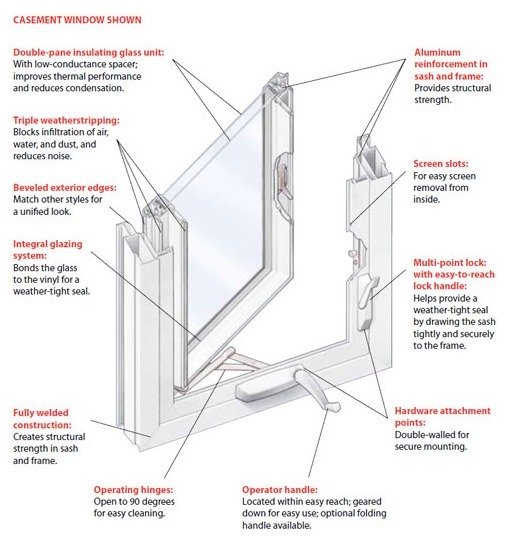 Most casement windows can swing open 90 degrees or close to 90 degrees, which is good enough for most situations. This gives you a totally open window space, whereas an open double hung window always has half the window opening covered with glass. One advantage of a casement window is that you don’t have to have a physical division of the window like you do with the double-hung. In a double-hung the opening is always divided into two halves. With a casement window no such division is required. A casement window opens with a crank. This might be preferred for some people. Others find them an inconvenience. You can get windows where they open electrically, often with a remote. These windows are pricey and you have to provide wiring to each window. The motor for the window takes up space, and although the motor is covered up, it tends to look a little like an after-thought to the window’s design. Both the appearance and costs are significant drawbacks, in my opinion, but where a window is difficult to reach a mechanized casement crank is a good idea. I was in a house the other day where the horizontal casement windows up high provided ventilation. These had been automated, and it’s a good thing the were for they were at least 20 feet off the ground. In my next article I will continue my discussion of the types of windows as I look at your material choices in windows.